STARTING BACK IN 2005, Midwest Dragfest (MWDF) has been held nine different times throughout the years. While the show experienced a brief hiatus during that time, it’s been back consistently since 2013, and it doesn’t seem to be going anywhere any time soon. 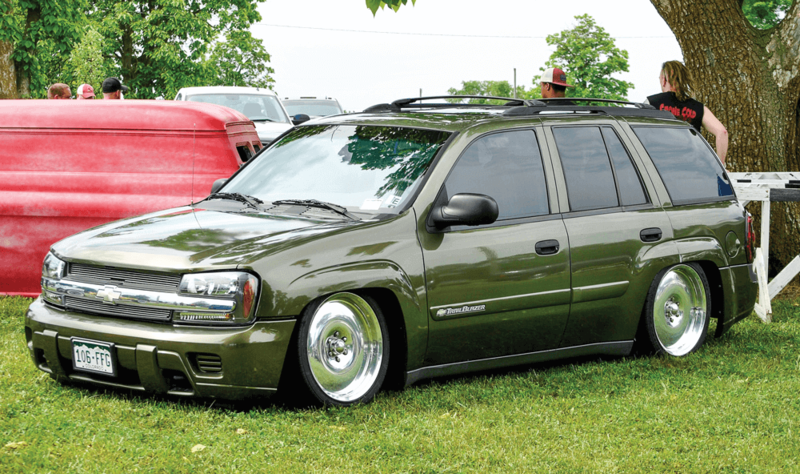 Known for its laid-back atmosphere and consistently high-quality builds, MWDF is without a doubt a hidden gem in the Midwest that’s worth the trip for truck owners and spectators. 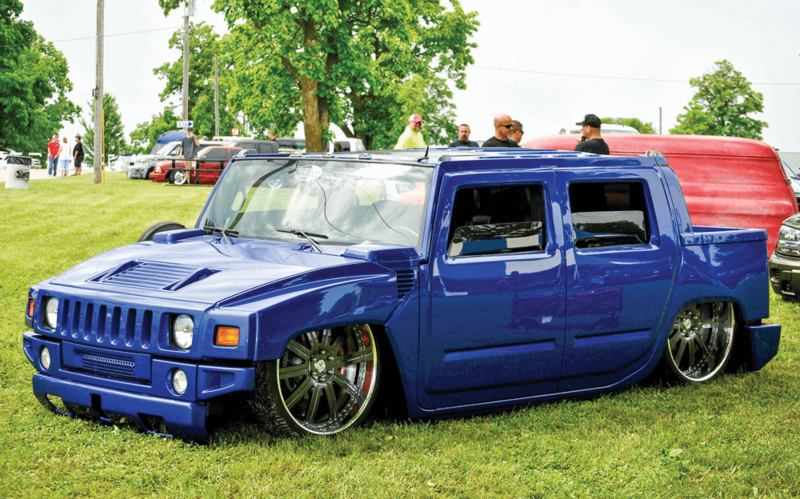 JIMMIE BROYLES BROUGHT HIS NEWLY COLOR CHANGED, BODIED HUMMER OUT TO DRAGFEST THIS YEAR. 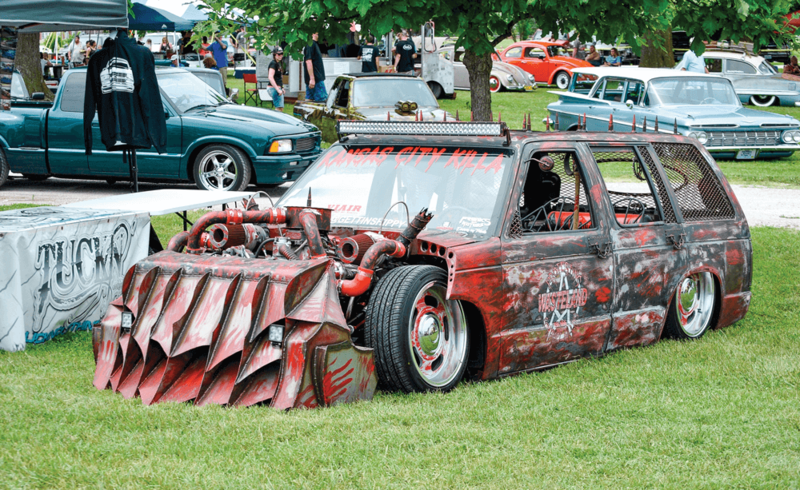 BROYLES ALSO RUNS ONE OF THE BIGGEST SHOWS IN THE MIDWEST, SLAMBOREE IN OKLAHOMA. As a first-time show-goer at this event, I wasn’t sure what to expect as I pulled into the relatively small town of Sedalia, Missouri. However, once I made my way out to the show grounds and started exploring, I was impressed by what the Missouri State Fair Grounds and well-organized staff of MWDF had to offer. Not only was it a very spacious area, but it was on grass instead of blacktop, which means far fewer people (including myself) left with a sunburn. 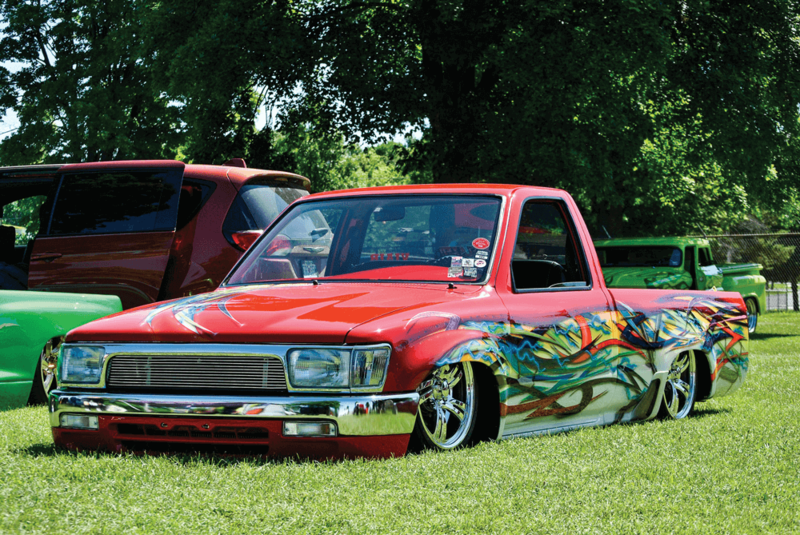 THIS RACE-INSPIRED RED C-10 CAUGHT A LOT OF ATTENTION FROM SHOW-GOERS. On the first evening of the event, MWDF throws a party for show attendees called Meatfest, and it lived up to its name. Watching the crew unload box after box of burgers and dogs to throw on the grill, as well as filling cooler after cooler with beer, well, it was clear that the MWDF staff really knows how to show people a good time. I should also mention that all of the food and drinks were free. How great is that? The next day, as trucks arrived for registration and started to fill up the park, claiming a favorite spot for the weekend was top priority. Once everyone settled in and the sun went down, it was obvious that this was going to be a stellar weekend. It rained for a while on Saturday morning, a circumstance that many owners dread, but in the Midwest, truck owners encourage it because it usually leads to lower temperatures throughout the day. Since this event is held the first weekend of June, everyone hopes for the coolest temps possible. The rain soon stopped, and the sun came out while trucks streamed through the gates. The show’s layout smoothed the judging process and fun events like a truck limbo and the staff-organized cruise on Saturday evening kept everyone entertained the entire weekend. MIKE BROTT KEEPS THE CLASSIC MINI-TRUCK SCENE ALIVE. 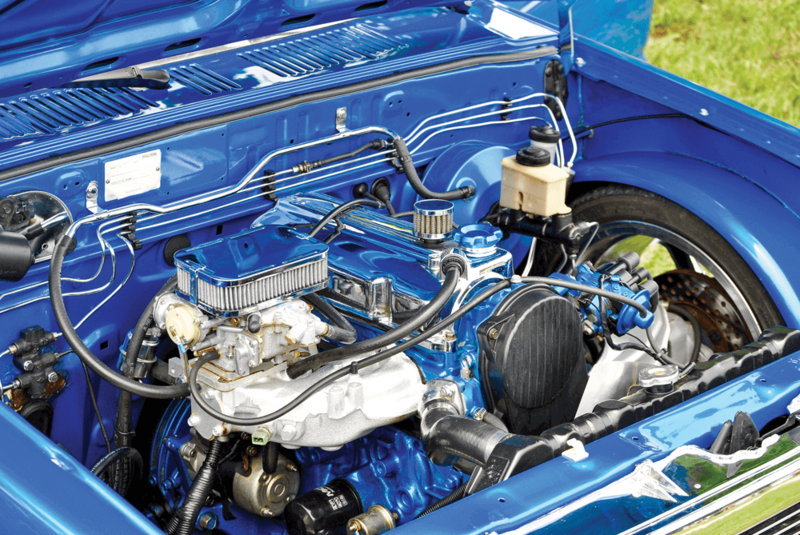 THERE IS NOTHING IN THIS ENGINE BAY THAT SHOULDN’T BE THERE —CLEAN AND LEAN ALL THE WAY. Sunday is the final day of the show and the last chance to see everyone’s vehicle laid out in the grass. You can also stick around to see who takes home one of the 50-plus awards, like Best of Show, which includes a $1,000 cash prize. Midwest Dragfest is a mustattend event, and 2019’s dates have already been released, June 1-2. Sponsors like Creative Audio, Drop Em Wear, Stone Cold Customs, Gooch Customs and many others make it clear that show has strong support behind it year after year. KEEP A LOOKOUT IN FUTURE ISSUES OF STREETTRUCKS FOR FEATURES ON THESE MINIS. Dragfest’s own Brenan “Mo” Moriarty wanted to give a quick shout-out to everyone who’s supported the show throughout the years, and he wanted to say a special thank-you to the entire MWDF crew, who kill it every year. Mo is motivated to put on a bigger and better show each year thanks to his crew and his wonderful wife Kerri, the muscle behind the mayhem. According to Mo, “Kerri kept me sane throughout all of the stress leading up to the show this year and even ran the food tent, taking a lot of pressure and work away from me.” Support like that is what every successful man needs in his life. GOOCH CUSTOM’S OWN BRANDON MCCOY LAYS DOWN SOME STRIPING ON A DODGE DAKOTA. 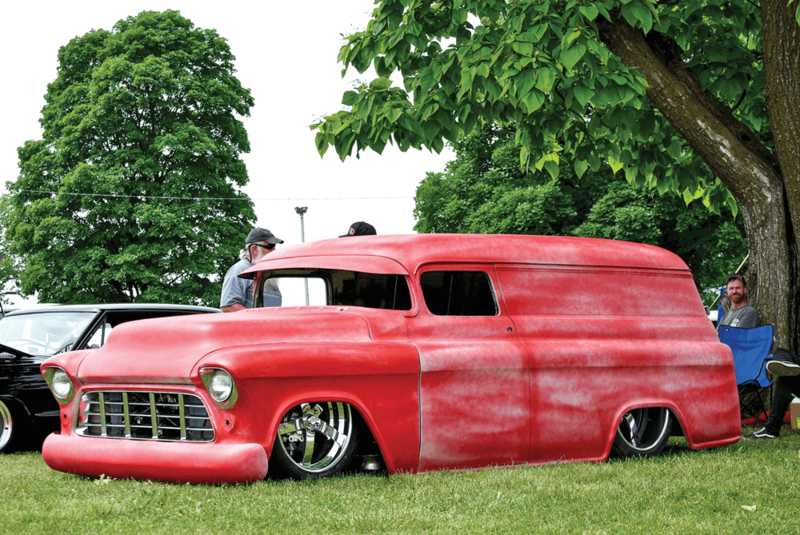 Be on the lookout for multiple features about trucks that attended this show in future issues of StreetTrucks, and we’ll see you next year in June at Midwest Dragfest. 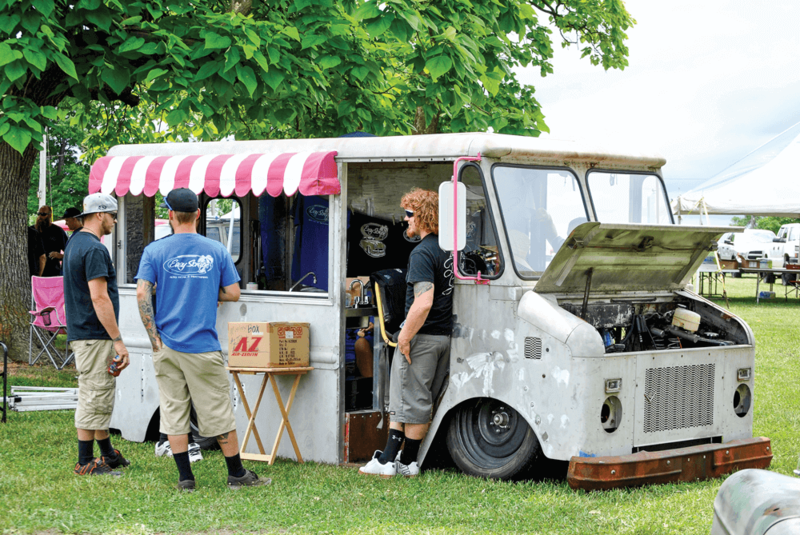 THIS ICE CREAM TRUCK TRIBUTE BUILD OUT OF MISSOURI HIDES AN LS SWAP AND SERVES AS A GREAT HANGOUT SPOT FOR VEHICLE OWNERS AND THEIR FAMILIES. 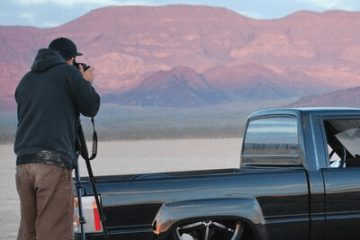 JIM STUART OF STONE COLD CUSTOMS DEBUTED HIS INCREDIBLE PANEL TRUCK THAT WILL BE FINISHED IN TIME FOR SEMA 2018. BE ON THE LOOKOUT FOR MORE ON THIS TRUCK SOON. 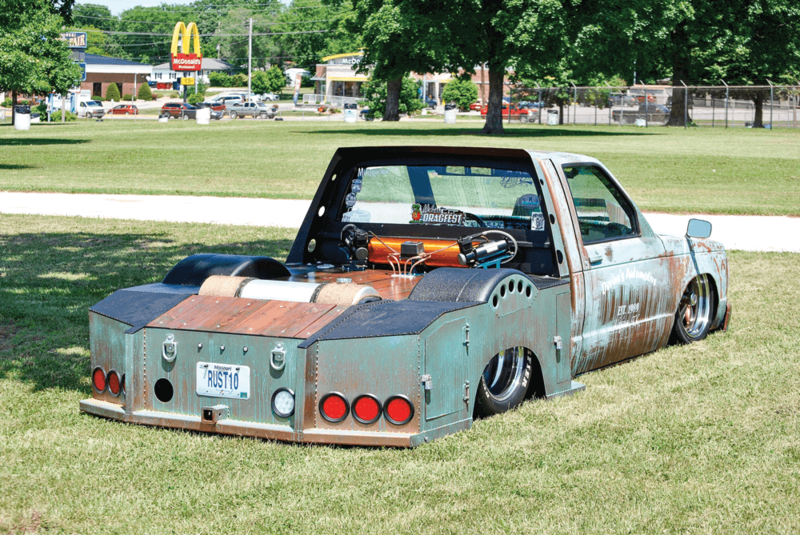 THE PAINT AND ATTENTION TO DETAIL BLEW THE JUDGES AWAY ON THIS SINGLE CAB THAT TOOK HOME BEST OF SHOW. ONE OF MIDWEST DRAGFEST’S OPERATORS, CLINT DEVINE, SHOWS OFF THE FULLY CUSTOM BED THAT WAS RECENTLY FINISHED ON HIS ONE-OF-A-KIND S-10.